The observatories and warm room appear to float on a forest deck which extends from the access contour. The deck is mounted on timber pilotis connected to the existing tree matrix. 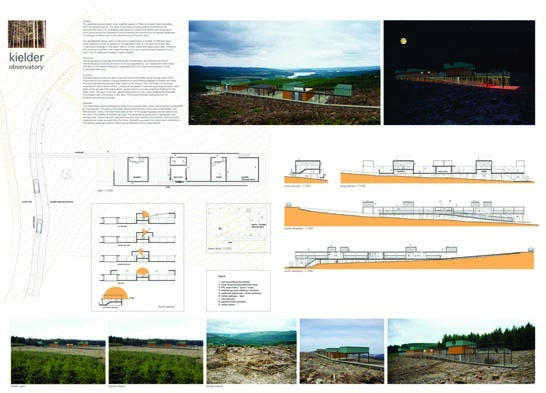 An undulating ramp leads to a lower level shelter and observation point which punctuates the composition and connects the structure to the greater landscape. A staircase connects back to the access level on the north face. 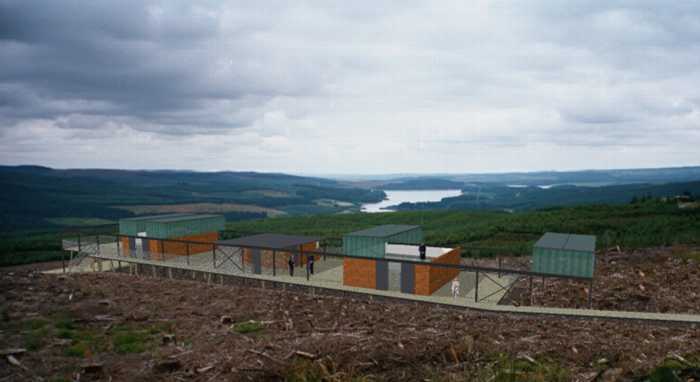 The arrangement allows users to take part in observing in a number of different ways, either adjacent to the car spaces by the approach track, on the elevated forest deck, in the scope housings, in the warm room or on the lower level observation deck. The observatory hoods are split in two and move horizontally along the top track of the frame and can be opened in various positions to give differing degrees of shelter and provide clear views to the horizon. The roof hoods of the scope housings are clad in photovoltaics. Energy will be stored in batteries adjoining the warm room. Solar panels will also heat water which can be stored to provide underfloor heating for the warm room. The warm room has glazed sliding doors to the corner allowing day and night time project work and access to the deck. The project provides sliding shutters for blackout and security purposes. The steel frame would preferably be made from recycled steel within the parameters established by the engineer. The walls of the observatories and the warm room have a lightweight cold formed steel frame. The lower level walls of the of the scope housings and the warm room are clad in thin sheets of weathering steel. The observatory hoods have a lightweight cold formed steel frame clad with polycarbonate and roof mounted photovoltaics. Deck and piloti materials are locally sourced from the forest. 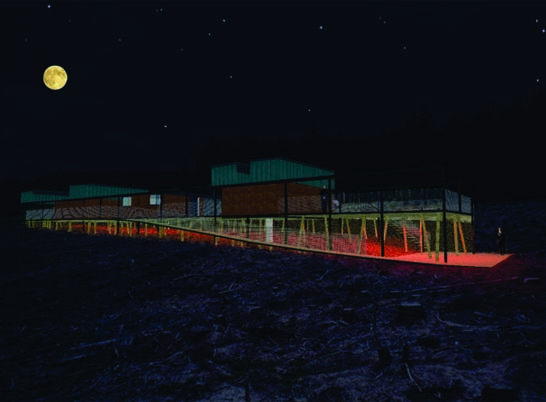 Red led’s punctuate the forest deck underbelly in the evening landscape without affecting the operation of the observatories.